The cow was described by her owner as a “cantankerous beast” and damaged several slate tiles. 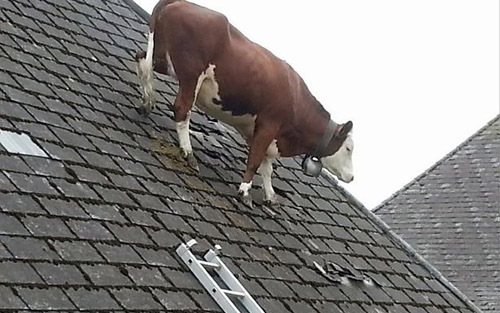 The steaks were high for this cow after she became stuck on a farmhouse ROOF. Not content with life on the ground, the animal headed onwards and upwards – and ended up perched atop this building in Bern, Switzerland. 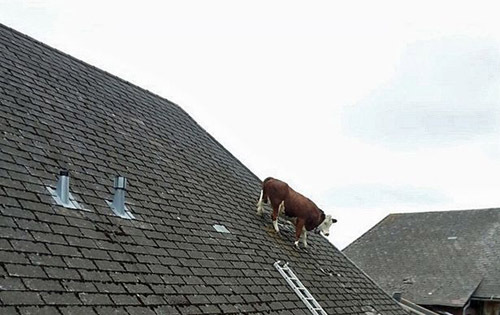 Looking like she might be about to graze on the slates, she balances on the slippery roof seemingly without a care in the world. The same could not be said for passers-by whose journeys ground to a predictable halt at the unnatural sight. Stunned cyclist Rolf Steiner said: “I couldn’t believe my eyes and had to look three times to make sure I was seeing what I thought I was seeing.